The Beach House: Coming Home was an easy, breezy read and perfect for summer reading. This is the second book I've enjoyed by Georgia Bockoven. The first was Things Remembered. Melinda was just a teenager when she gave up her baby (Shiloh) for adoption. Thirteen years later, she gets a call that her daughter wants to meet her. Melinda arrives at the beach house in California where she is to stay for two weeks while Jeremy, Shiloh's adoptive father makes up his mind about whether to let his ill daughter pursue a relationship with Melinda. This is very much a character-driven story with a dual timeline, alternating between the present and Melinda's childhood. I enjoyed the well-developed characters and the themes of family, friendship and adoption. 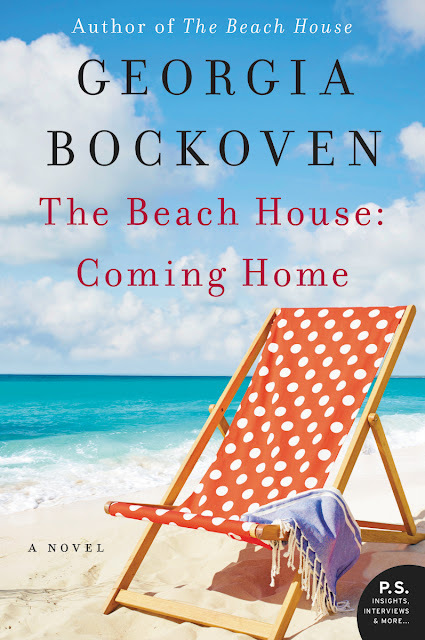 The prologue introduced the beach house but it didn't feel like a significant part of the book as described in the book's description. Instead, the mining town where Melinda grew up was much more significant and helped us to understand her background, her fears, her motivations and her past relationships, which is why I liked the dual timeline. For most of the story, Melinda needs to get past the animosity of Jeremy who is overprotective of Shiloh and dislikes Melinda for having given up her baby. I understand his wariness because his own wife left him and Shiloh. But, it's clear he doesn't understand the challenges of being a teen mom from a small hick town with no financial support. I had a bit of a hard time liking him because of his lack of compassion. I could understand his fears if Melinda came in to town wanting to swoop his daughter away but that wasn't the case. There is tension between Melinda and Jeremy because of his apprehension of her and her wariness of his mistrust, but I did not feel much romantic tension. The story takes place within the span of two weeks so when he is suddenly all over her, I just thought it happened too quickly and a little unrealistically. Overall, this was an enjoyable book. One of my favorite characters was Heidi, the stray kitten Melinda takes in. I simply loved the scenes between her and Melinda. I am always attracted to family stories that include children and pets. To read more reviews, please visit Georgia Bockoven's page on TLC Book Tours. Disclosure: Thanks to the publisher and TLC for sending me this book for review. I was not compensated in any other way, nor told how to rate or review this product. Those quick romances usually don't work for me either but the book still sounds fun!